Upgraded recently organised a pitch coaching event together with Superhero Capital. All Upgraded’s member startups were invited to join to upgrade their pitch to the next level. Here’s a summary of the event for all of you who couldn’t attend but are still interested to perfect your pitch. 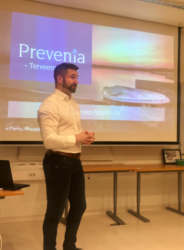 Our coach of the evening was Kasper Suomalainen from the VC fund Superhero Capital. 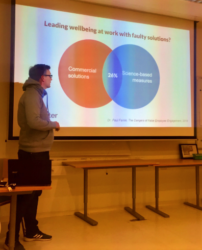 Previously, Kasper has worked as Captain of Startup Sauna’s accelerator program and as the producer of Startup Radio. He has also worked with Slush in 2013–2017. Now he is an Associate at Superhero Capital making early-stage investments mainly in B2B software; health tech being one of the industries they look at. The most recent addition to their portfolio is Adesante, whose expertise is in 3D medical imaging for surgery planning with virtual reality. 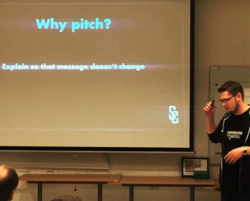 Why is a good pitch so important to a startup? 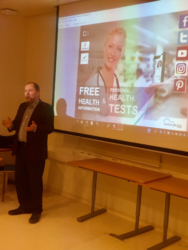 Below you can see Prevenia (health coaching services), Medigoo (health tests for home use) and Emooter (work satisfaction/wellbeing measurement tool) taking the stage before getting feedback from Superhero Capital and the rest of the audience. After the pitches, Kasper gave a keynote on the essentials of a great pitch. He emphasized that a pitch always has a goal and an ask, which might be to sell your product or get funding. Always define your goal and ask for something! After all, you’re on stage presenting (or sitting in a meeting) for a reason, right? We were taken through the structure of a good pitch, which includes elements of the following: Slogan, Problem, Solution, Business model & market, Traction, Competition, Team, and Ask. Another important note was that a pitch should showcase what you do so clearly that even your mother would understand it. So why not test your pitch with your mother! (A Good Read: the Mom Test.) Also make sure that the message of your pitch doesn’t change, so that it comes across the same even with different audiences. Kasper Suomalainen from Superhero Capital. For example, Enbritely won 500 000 € in the Slush 100 pitching competition in 2014 with their great pitch. Another example of a great pitch in is the Dollar Shave Club advertisement. The company uploaded the video on Youtube and got 12,000 new orders in two days. The video has now over 25 million views! After pitching it’s often time for questions, and the way you answer those questions is almost equally important as your pitch. If you didn’t have time to go through all relevant information in your pitch (e.g. competition), you should be prepared to give a short and concise answer about the subject. In addition, if you don’t have the information, you might want to dodge the question, for example, by saying “I’ll connect you with the person in our team who can give you the most thorough answer”. Say thank you, not sorry! As an endnote, Kasper showed how you can turn a negative into a positive, just by saying “Thank you” instead of apologising. For example, if you are struggling with the english language, instead of saying “Sorry for my bad english”, you can thank the audience for bearing with your personal accent! So thank you, for reading all the way to the end! And remember, to tell your story in relatable way, start with “the Why” and be yourself. Looking for early stage funding? Want to attend Upgraded’s events? Become a member and follow us on Facebook to hear of our upcoming events!